Nice red crimson colour. Open nose with really fresh red fruits notes. In mouth, riper fruit aromas compared to the nose and "guarrigue" notes. Suits very well with warm red fruit marmalade, a braised lamb and aubergine gratins. 100% hand harvested selection of the grape, cold maceration.Pumping over twice a day. Aging during one year with 10% in barrels. USA VINTAGE 2013 : Bright ruby. Fresh dark berries. Asian spices and lavender on the highly perfumed nose. Fresh and seamless on the palate offering concentrated black raspberries and cherry compote flavors that become sweeter with air; closes juicy and quite long with sneaky tannins adding shape and gentle grip. VINTAGE 2012: The nose is relatively fruity. It reveals notes of very ripe cassis, blackberry and slight notes of crushed blueberry, woody notes associated with a very discreet hint of very ripe red fruits, liquorices as well as a discreet hint of truffle and spices. The wine needs to be decanted (carafe). The palate is fruity, sleek, relatively gourmand, relatively mineral and offers a fine acid frame as well as a beautiful silky. In the mouth this wine expresses notes of fleshy blackberry and juicy plum associated with slight notes of ripe red fruits, ripe blueberry as well as a discreet hint of zan and a discreet few toasted/caramelized hints. Good length. Vintage 2011: Deeply-coloured garnet. Nose of undergrowth, leather, fur and stewed stone fruits. Articulate palate with mature fruits aromas nuanced by mild spice. Powerfulness adds to the wine's personality. Set aside for foods in a sauce. vintage 2010 - USA Showing outstanding potential, the 2010 Famille Quiot Vacqueyras Château du Trignon is a beautiful blend of Grenache and Syrah that is aged 90% in concrete and 10% in smaller barrels for a year. Tight, and slightly reserved, yet also classy and still showing beautiful, it possesses quality black cherry, leather, licorice, flowers, and hints of herbs to go with a medium-bodied, balanced, and juicy palate. Very well made and showing plenty of ripe tannin, it should shine for just under a decade. Vintage 2010 Vivid ruby. Mineral- and spice-inflected aromas of red berries and fresh flowers show very good energy and clarity. Juicy and precise on the palate, offering brisk raspberry and bitter cherry flavors that gain weight with air. The floral note comes back on the persistent finish, which features silky tannins and a touch of spicecake. There's an almost pinot-like delicacy to this wine that makes it very attractive right now. 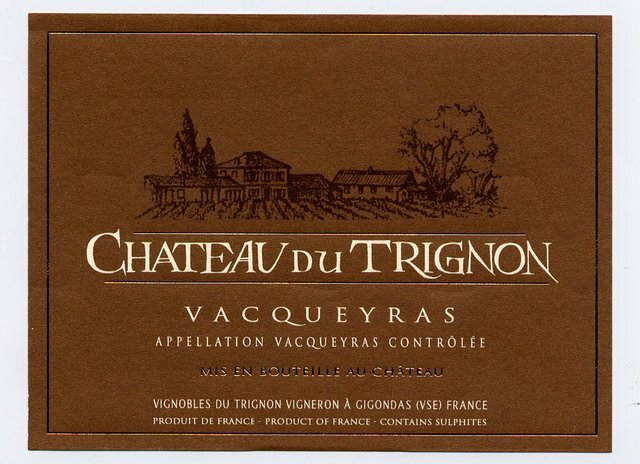 Vintage 2011 - The 2011 Vacqueyras Chateau Du Trignon is a rock-solid blend of Grenache and Syrah that was aged in a combination of tank and old foudre. Representing a good value, it offers plenty of spice-laced dark fruit, leather, pepper and earthy notes to go with a medium-bodied, nicely concentrated profile on the palate. Balanced, very well made and certainly delicious, it should be enjoyed over the coming handful of years. Alcohol abuse is dangerous for the health. Know how to consume and appreciate in moderation.